It wasn’t an ideal start. I smiled as my buddy removed his mask and blearily pawed at the water in front of him. As my mouth widened, a salty fireball slid past my tonsils. I retched through my mouthpiece, but white panic set in. I broke the golden rule and launched up to the surface. Under the water once more, I focused on my breathing to distract myself. In for four, out for eight. I checked my tank volume and was still on 120. I wondered what my dive group were down to. I hoped I wasn’t depleting my O2 faster and thereby ending the dive sooner. Our instructor Antonios gathered us, using hand signals to show we were to swim into the mouth of the cave one by one. As I hovered, I watched his black fins disappear into the murk. I wished I had a torch. The second diver followed his tail and was consumed by the darkness. Only a silver trail of bubbles snaked their way back out over the rocks. This was the only exit – inside was a deep well. I entered next, and a few extra metres down, a wash of cool water hit my brain. A spattering of electric blue miniature fish were suspended beside me. The craggy roof was treacherous and my arms were crossed as I tried to navigate, following the fading fins ahead. Fluorescent orange and purple anemones lined the wall but vanished when the torches struck them. We were careful to not stir up the muddy sea bed as this would blind us completely. 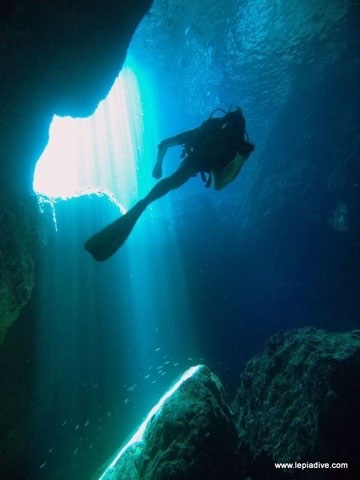 A shock of white light filled my mask as the diver ahead began swimming back towards me. Communication was impossible here since we couldn’t speak or see, but his panic seeped into my suit. I instinctively spun 180. Once out, our instructor gestured him to kneel in the sand. Surfacing wasn’t an option – he needed to decompress and do a safety stop with us to avoid the dreaded bends. We left him outside with a piece of string attached to an orange buoy, swaying like an underwater kite. Back inside, a flood of calm drained through me as the water temperature dropped. The white translucent bodies of giant shrimp glowed, and they danced like spiders in the dark sand. The tunnel opened up then narrowed sharply to a steep bank, where a solitary hermit crab skittered away from us. We approached the lip. I squealed through the regulator. Below us lay an endless cavern filled with blue light. Slow moving sediment swirled in the hazy void, and time stretched out beyond the limits of our tanks. Image courtesy of their website. Previous Post Show me the way to Cristo Blanco!